The largest ever oyster farms in Southeast Alaska could be coming soon. That’s in line with the state’s Mariculture Task Force that sees the potential for a $100 million industry in Alaska. Silver Bay Seafoods has been buying and processing salmon and herring at its plant in Sitka for the past decade. The company says it wants to do something new. 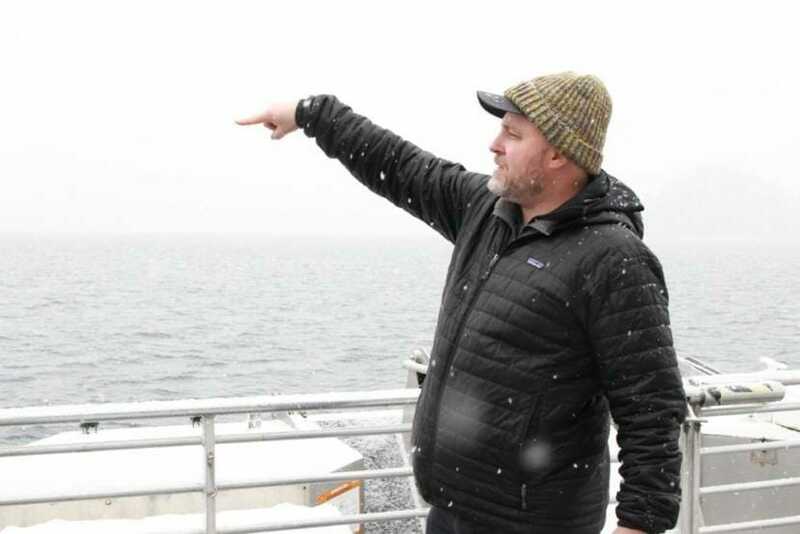 Silver Bay recently chartered a boat to take a group of local business people, academics and seafood industry boosters to see the site of its oyster venture about 13 miles from Sitka’s harbor. It’s in a cove near rocky shoreline. Not much to see – yet. “If this were to go through, what you’d see here would be a series of rafts that we’d use to suspend oysters from,” Sheridan tells the group. At this point it’s still if. Silver Bay has been working on securing a 10-year lease from the state’s Department of Natural Resources since 2017. Alaska has produced oysters for decades. But never on the scale being proposed here. Many in Sitka are watching with interest. There hasn’t been any vocal opposition but response has been cool. Sitka Tribe of Alaska’s Jeff Feldpausch said the tribe is taking a careful look at the proposal. It hasn’t taken a position. Sitka has had a checkered history with oyster farms. In 2009, about two dozen people fell ill after eating the oysters grown in Sitka’s Whiting Harbor. It soon closed down for good. A year later, an invasive species of sea squirt was confirmed to have colonized the seafloor around the shuttered oyster farm. The area around Whiting Harbor has been a no-go for area for boats ever since. Alaska Department of Fish and Game’s invasive species coordinator Tammy Davis can’t say with certainty where the invasive sea squirt – also known as tunicates – came from. “Whiting Harbor is the only location [in Alaska] where the Didemnum vexillum is found, and it’s quite a jump from the British Columbia populations that have been present since the ’90s,” she said. But many in the community blame the old oyster farm. Efforts continue to eradicate the invasive sea squirt species also known as D. vex. So when there’s talk of bringing oysters back to Sitka Sound, locals say they want assurances there will be no repeat of the Whiting Harbor debacle. Alaska Department of Fish and Game’s invasive species coordinator knows all this history. She says any new oyster farm operation should be required to regularly survey its gear. “So that should an infestation occur it isn’t potentially years between the introduction and detection,” she said. That’s among the formal recommendations by Fish and Game to the Department of Natural Resources, which is reviewing Silver Bay Seafood’s application to lease 182 acres of seafloor. Other agencies have chimed in. The U.S. Forest Service has asked that public access be protected for people accessing the shore. And Sitka’s city staff penned an unsigned letter saying the city and borough generally supports mariculture as long as it doesn’t conflict with other users. “Is it going to interfere with any existing uses? That’s the big one for Fish and Game,” said the agency’s acting mariculture coordinator Lorraine Vercessi. Commercial, subsistence, and sportfishing is the way of life on Sitka Sound. “We just want to make sure it’s not going to inhibit any of the other users,” Vercessi said. Silver Bay says none of these concerns would be a deal-breaker. Christy Colles runs DNR’s regional lease office. And lately her staff has seen applications for larger oyster farm leases. A 127-acre farm in Doyle Bay off Prince of Wales Island recently completed its regulatory review. It’s nearly as big as Silver Bay’s proposed farm and both dwarf any oyster farm proposal to date. “I think our largest farm is, prior to Doyle Bay, going as far as it has, is like 26 acres,” Colles said. She credits the Mariculture Task Force established by Gov. Bill Walker three years ago. It projects Alaska’s mariculture sector — which includes shellfish and seaweed — could grow to a $100 million industry in 20 years. Alaska’s existing oyster farms face challenges — shellfish grow slower in colder waters. Overhead costs are higher in Alaska. Decker said larger oyster farms like the ones proposed in Sitka Sound and off Prince of Wales Island could be the future. “There’s farms this size and larger in British Columbia, the state of Washington, Oregon and California — so up and down the West Coast — but Alaska is still untapped that way,” she said. Silver Bay Seafood’s oyster farm proposal is out for public comment through March 1. The Prince of Wales Island farm still needs to post a bond, pay its fees and sign for the lease. Once permitted, both farms bring millions of oyster seed to Southeast waters by the end of this year. Jacob Resneck is the regional director with CoastAlaska in Juneau.